It’s the fourth fabulous issue of WHO’S WHO UPDATE ’87! Shag and Rob take a look at new and updated characters such as Lois Lane, Marine Marauder, Mon-El, Power Girl, The Question, Protector, and more! We wrap up with your Listener Feedback! Weird Love #1 gives us a lot to talk about, but we stick to The Taming of the Brute, originally from Charlton’s Just Married #53. It’s a doozy and makes for a great installment of Romance Comics Theatre. Along the way, we talk up IDW’s Weird Love series, Max Headroom, and Shakespeare. Kid you not. 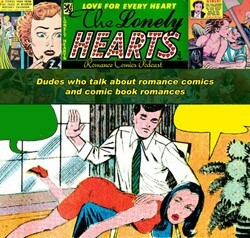 Listen to Episode 6 below (the usual filthy filthy language warnings apply), or subscribe to The Lonely Hearts Romance Comics Podcast on iTunes! Chris and Cindy return once more to Opal City for another session of Starman Chronicles! 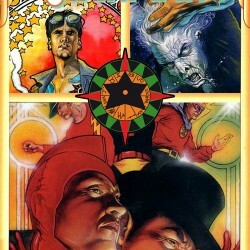 They cover Starman #7-11 by James Robinson, Tony Harris, Wade Von Grawbadger and friends! Jack Knight has a harrowing night at the circus, and meets an unexpected ally…a former Starman! Jack learns a dark secret from his father’s past, as his sworn enemy Nash escapes prison. Then Starman tackles the swamp monster known as Solomon Grundy…but he’s not quite what Jack expected! Finally a tale from Times Past: The Justice Society of America battles the machinations of mort turned messiah, the Ragdoll! Cindy and Chris join Professor Alan and Emily Middleton, Michael Bailey, and Bob Fisher on Michael Bradley’s Superman and Batman podcast to discuss the premiere of the Supergirl TV series! Next time: A special surprise segment, plus, your feedback (we mean it this time)! Host Rob Kelly and returning guest John Trumbull discuss 1967’s spy thriller OPERATION KID BROTHER, starring Adolfo Celi, Lois Maxwell, Bernard Lee, Anthony Dawson, and Neil Connery…yes, NEIL Connery! Plus your Listener Feedback! It’s a horror-ible double feature! First up, Rob Kelly once again welcomes guest Mike Gillis (RADIO VS. THE MARTIANS) to discuss the groundbreaking horror classic, George Romero’s DAWN OF THE DEAD! Let’s go to the mall everybody! That’s followed by Rob and guest Richard Harland Smith from TCM’s Movie Morlocks to talk about 1976’s BURNT OFFERINGS starring Karen Black, Oliver Reed, and Bette Davis!